Every third Saturday of the month there is an artisinal produce market in Sansepolcro, a small city just north of us, barely across the Tuscan border. Sssshhh…don’t tell anyone that we cross the border into tuscany! The farmers market was fun, and we got to chat with Brent, the goat cheese maker from Valle di Mezzo, as well as buy some of the elusive local saffron, but our greatest discovery was the butcher in town. The shop is picture perfect with gorgeous meats and an astonishing flat screen TV that shows how porchetta is made. Porchetta is a local specialty where a whole pig is roasted with garlic and fennel until it’s skin is a varnished crackle. That sounds just fine, but when you literally see a whole, boneless pig…it’s huge! The salt is massaged in by the trowel load, the garlic is dumped in by the scoop, the fennel is the whole long stalk of fennel tied into huge bunches about 6 inches across and they use two of these bundles…well, the scale of the operation is simpy massive. Our friend John bought the biggest rabbit hindquarters any of us had ever seen and I bought a rolled, boneless duck breast. Because it’s built right into their DNA, the butcher and the fishmonger cannot hand over their product without a recipe, it’s as natural as breathing. I was told to just roast my duck as it had alrady been seasoned with garlic and fennel. Just having watched the pig video, I was more than convinced that my duck was adequately seasoned. What I didn’t expect was that it had been seasoned with pancetta (think of a cured, not smoked, bacon). 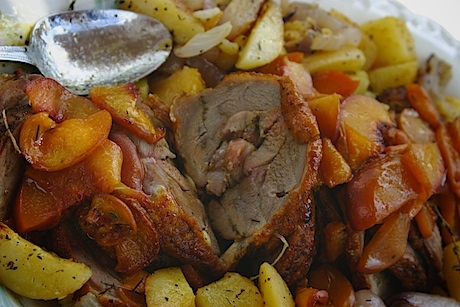 Big cubes of pancetta were embedded in the heart of the anatra, or duck. So you have one of the fattiest birds around, stuffed with bacon….needless to say, it was delicious! Simply roasted, then finished with some bourbon roasted peaches. So turduckin move over…there’s a new guy in town, the anatracceta! P.S. John made an outstanding dish with those big bunny hindquarters, braised with sweet peppers that reduced down into a thick sauce that begged to be scooped up with a spoon or a piece of bread. It’s almost worth a trip to Tuscany to go back to the butcher!